How much do we really know about the water that comes out of our taps? If you live in Port Alberni, you’re lucky—the water that comes out of your tap is clean and plentiful. Even during droughts, Port Alberni fared better than its neighbours in Nanaimo, Parksville or Victoria. “Water defines our city. It’s our history and our future. It’s essential, it’s powerful, it’s precious and it’s something we can’t take for granted,” Mayor Mike Ruttan said at the opening of the city’s new ultraviolet water treatment plant. But how much do we really know about the water that comes out of our taps? These days, the answer is a whole lot more, according to city engineer Guy Cicon. During the fall of last year, Cicon contracted Sandy Grant Surveying to map the bottom of the city’s two drinking water reservoirs. 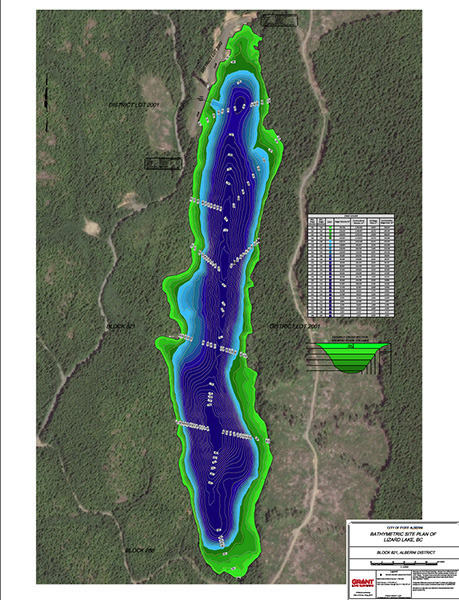 “We received this sonar data of our two lake reservoirs, Bainbridge Lake and Lizard Lake. Our data maps out the topography of the lake bottom,” said Cicon. The maps for Bainbridge Lake and Lizard Lake are shown below. 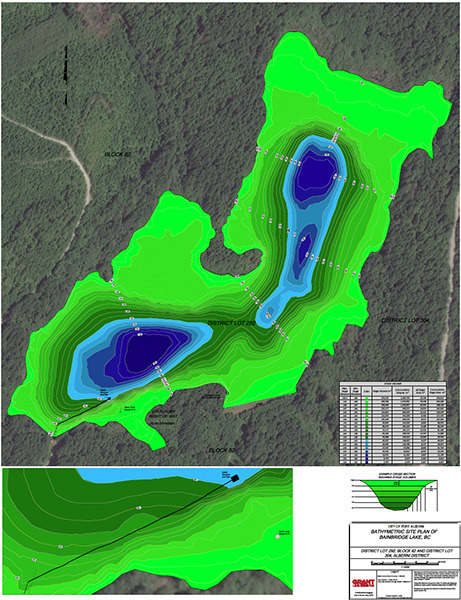 “It provides us with the volume of the lake and we can calculate volumes at different levels within the lake. Sonar involves using sound waves to map out a body of water. Recently, it’s been used by the Chinese government as part of the search for MH370, the Malaysian Airlines plane that disappeared over the southern Indian ocean in March 2014. While Cicon didn’t find any wreckage at the bottom of either lake, he did find an assurance. “It gives us more confidence in the amount of water we have available during drought conditions,” said Cicon. There are four main factors: “How much water is seeping out of the lake into the ground, how much water is evaporating, how much water is coming in and how much water we’re drawing. It’s a lot of water; Lizard Lake, which flows out into China Creek, has 650,000 cubic metres of usable drinking water when full. Bainbridge Lake has 1.5 million cubic metres. In comparison, this summer Port Alberni used 1.3 million cubic metres of water over June, July and August of 2015. Reservoir lake levels took a hit, with Cicon seeing them drop earlier and further than ever before. But even should Port Alberni be hit with a harsher drought this summer, Cicon said that the city will be fine. “The usable volume in each lake is the volume of water that is above the intake pipe,” he said. The intake pipes for Bainbridge Lake and Lizard Lake are 10 and four metres deep, respectively. Those depths were decided upon in connection with the building of the dam at Lizard Lake and to allow the Bainbridge Lake connection to the treatment facility to be gravity-operated. Having water volume knowledge will allow the city to see how much influence each of the four factors that control water availability have. “The reason why this information is so valuable is that it does help us predict the longevity of our water supply during drought times,” Cicon said. It also gives Cicon confidence that the city’s water supply will accommodate any future growth. “There will still be enough water in 50 years,” he said. What the city will do with its water supply in 50 years is anyone’s guess; a regional water study update commissioned by the Alberni-Clayoquot Regional District in 2010 recommended using China Creek and Bainbridge Lake (what the city currently uses) as the Alberni Valley’s main water supply, with Sproat Lake being used as a secondary source. Currently, the city provides water to its residents, Beaver Creek and the Hupacasath Ahahswinis reserve and the Tseshaht Tsahaheh reserve. A regional water solution would have that expanded out to other districts within the Alberni Valley. The total capital costs for the China Creek, Bainbridge Lake and Sproat Lake water system would be $10.6 million; however, costs were estimated prior to the city’s construction of its $4 million ultraviolet water treatment plant. Using Sproat Lake as part of a regional water supply is something the city is considering. “It ultimately could become the water supply for the entire Valley and as we move further and further down the road of climate change, Sproat Lake water may become increasingly more important,” Mayor Mike Ruttan said in an interview last month.